A brief derivation of the cross section in the independent particle approximation for some of the spectroscopies treated in the msspec program package is presented . 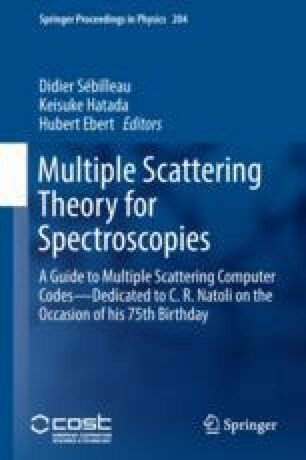 We solve the related Schrödinger equation with a complex energy-dependent effective potential in the framework of multiple scattering theory to write the cross-section for photoemission and photoabsorption in a physically transparent way that provides insight in their interpretation and analysis. Relativistic corrections are also implemented. In order to be able to apply this theory to a wide variety of systems we use a kind of all-purpose optical potential, depending only on the local density of the system under investigation, and discuss its merits and drawbacks. A Green’s function approach is shown to be necessary to write the photoabsorption cross section in the case of complex potential.